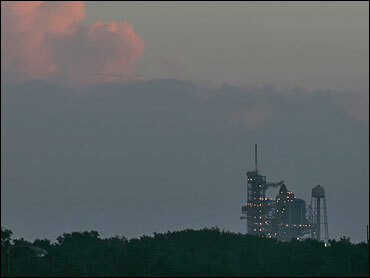 Five hours after starting space shuttle Atlantis on a slow crawl toward its protective garage, NASA changed course Tuesday and sent it back to the launch pad, saying the forecasts for Tropical Storm Ernesto had improved. Forecasters lowered their expectations for Ernesto's intensity. Its peak winds were expected to be less than 79 mph, the amount at which it is mandatory to return the space shuttle indoors, said NASA spokesman Bruce Buckingham. Atlantis was almost halfway into the 12-hour journey back to the Vehicle Assembly Building when NASA managers reversed course Tuesday afternoon. Although Ernesto has shown few signs of strengthening, Floridians remain on alert, especially in the south, because it could still dump five to ten inches of rain and flood certain areas, CBS Radio News correspondent Peter King reports. Atlantis' main mission is to add a key 17 1/2-ton construction truss to the space station, including two solar wings that eventually will provide a quarter of the space station's power. Fourteen later shuttle flights until 2010 — the agency's self-imposed construction deadline — depend on its success.